This year’s User Group Summit brought together over 6,000 people, including users, partners, sponsors, experts, and Microsoft Dynamics 365/CRM MVPs. 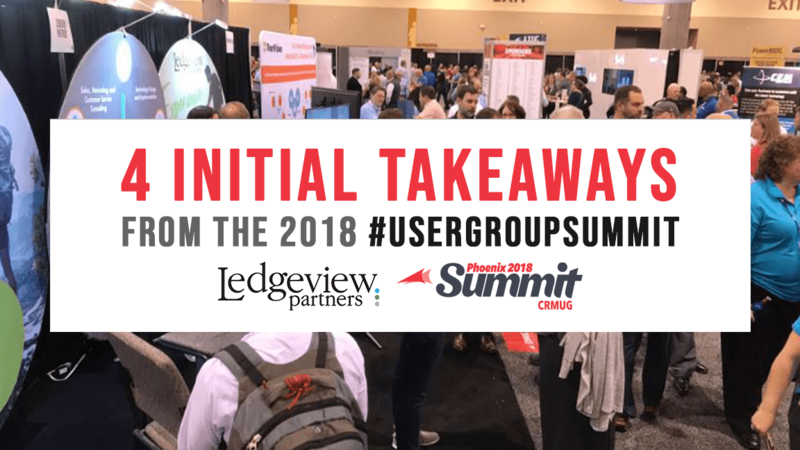 The summit, sponsored by CRMUG, was a successful, informational, and collaborative event that is sure to be discussed and celebrated until next year’s User Group Summit in Orlando, FL from Oct. 13, to 18, 2019. Depending on which track you followed, or the role you had while attending the summit, your key takeaways will likely vary. 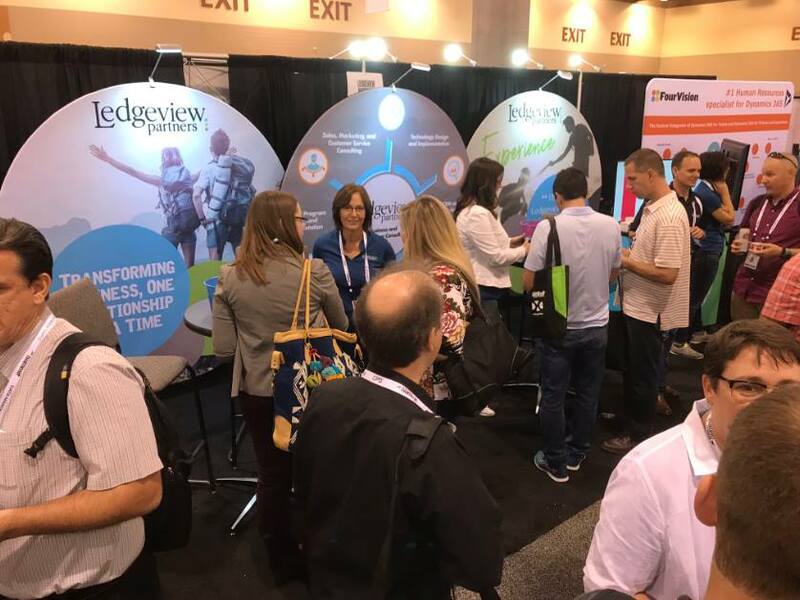 Within this post, the Ledgeview team shares some key takeaways they had from this year, amid working a busy exhibit hall and hosting many exciting educational sessions. These takeaways are important to keep in mind, whether you had the chance to attend the conference or not, as they highlight upcoming innovations, updates, and important happenings in the Microsoft Dynamics 365/CRM universe. PowerApps are here, indeed, and here to stay and evolve. The use of them and how many are deployed in production environments has sky-rocketed in the recent past. Much of the conversation at the 2018 User Group Summit was dominated by this topic. Innovative CRM partners, like Ledgeview, will be making better use of PowerApps moving forward with their customers in order to deliver the most effective solutions. Along with PowerApps, the term Power Platform was widely used throughout the conference, which is a set of applications that can automate almost any process. Through having the chance to speak to many users at the conference, Ledgeview heard time and time again, how valuable it is to them, to have key CRM resources available. This is why we’re happy to provide you with the tools you need to succeed, whether it’s eBooks, infographics, blogs, videos, on-demand webinars, demos, etc. At the 2018 User Group Summit, users likely discovered more ways to use Microsoft Dynamics 365/CRM to meet almost any of their business needs. While the concept might not work for the “average” business, the art of the possible is always exciting to see come to life, and it certainly wasn’t missed at this year’s summit. This is a huge investment, and could encompass anything from Adobe Marketing Cloud, to LinkedIn Sales Navigator, to Office 365, to Power BI, to Dynamics 365, and beyond. This makes a good case for the concept of utilizing PowerApps more comprehensively. It’s not just about one system. It’s about the bigger picture, and what it means for your bottom line. If you are among the crowd of users and organizations struggling to achieve high, continuous user adoption, we recommend taking advantage of the many resources Ledgeview has on the subject. There’s a lot to cover, but, rest assured – achieving high, continuous user adoption is possible, and you aren’t the first or last organization to experience this, often, ongoing problem. If you need help gaining high continuous user adoption, reach out to Ledgeview for support. Our experts can help guide you every step of the way. At Ledgeview, we’re thrilled to be a part of your CRM journey. Contact us when you need help with your CRM project, and learn more about our CRM Consulting Services here.